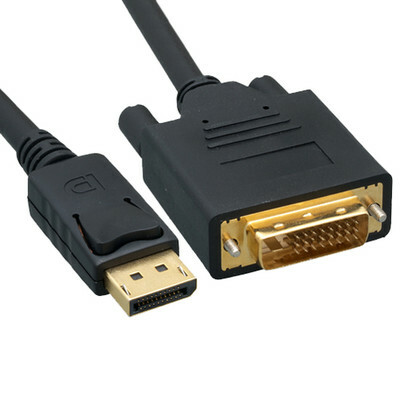 This 6 foot Displayport to DVI cable from CableWholesale will allow you to connect a DisplayPort compatible device (PC/Laptop) to a monitor with DVI input. Perfect for when your display uses DVI yet your computer or laptop only has DisplayPort. Physically different from HDMI, Displayport is typically found only on computers as a video output. Exactly what I needed. Good quality and fantastic durability. quality cable that is performing just as expected and needed. Description only had one picture and did not specify if the cable was active or passive. As such, I ordered the wrong cable. I will be calling on Monday to coordinate a return. exactly what I needed and works great! A basic adapter cable. Units worked as expected. One of the better prices on the internet. Purchased a new computer after 5 years to learn I could not hook my multiple monitors to it due to the new Display Port that has replaced SVGA and even DVI. Thank goodness CableWholesale.com came to the rescue. I could have driven down to my local Besy Buy and paid around $60 for these, or waited 2 or 3 days and paid $18 for the same thing. Works great, thank you! DisplayPort to DVI Video Cable- This cable worked perfect to connect a second monitor (DVI) to my computer (DisplayPort). The 6 foot length allowed me enough slack to arrange the monitors on my desk. These cables are very nicely constructed. The perfect combination of high quality and low price that I've come to expect from Cable Wholesale.